Aug. 17 (UPI) — Tree ring analysis has helped scientists pinpoint the date of Thera’s eruption. The volcano on the Greek island of Santorini erupted sometime during the 15th or 16th century BC, but scientists have previously been frustrated by discrepancies between radiocarbon and archaeological evidence of the ancient eruption’s precise timing. “It’s about tying together a timeline of ancient Egypt, Greece, Turkey and the rest of the Mediterranean at this critical point in the ancient world — that’s what dating Thera can do,” Charlotte Pearson, an assistant professor of dendrochronology at the University of Arizona, said in a news release. The latest findings, analysis of carbon in tree rings traced to the time of the eruption, have revealed an agreement, or overlap, between the timelines offered by radiocarbon and archaeological evidence. The breakthrough, detailed in the journal Science Advances, will help scientists more accurately date ancient Mediterranean artifacts. The ancient eruption buried Santorini’s Minoan settlement in a 130-foot layer of ash and pumice. Thera’s volcanic ash was deposited as far away as Egypt. Archaeological artifacts from across the Mediterranean, found near the layer of ash, suggest Thera erupted between 1570 and 1500 BC, but radiocarbon dating of organic material found just beneath the ash layer suggests Thera erupted around 1600 BC. The latest tree ring analysis determined the eruption occurred sometime between 1600 and 1525 BC. Researchers have previously used tree rings to accurately data an ancient volcanic eruption in Iceland. Scientists analyzed more than 285 tree samples featuring rings relevant to Thera’s eruption timeline. Because carbon-14, found in all organic matter, decays at a steady rate, scientists can determine when a tree rings grew by how much carbon-14 is found in each ring. Trees like Irish oaks and bristlecone pines, which grow a new tree ring every year, can offer scientists a record of environmental history dating back thousands of years. When, large volcanic eruptions spew ash into the atmosphere, more sunlight is reflected and global temperatures drop. Cooler years result in narrower tree rings. Among the newly analyzed tree samples, scientists found several narrow rings dated to between 1600 and 1525. 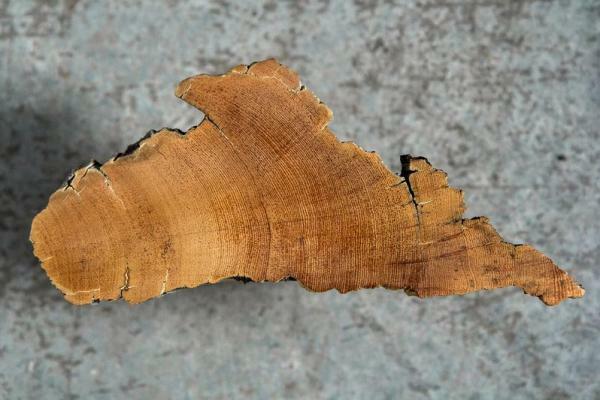 Scientists hope other researchers will used their method of tree ring analysis to recalibrate radiocarbon dating of other types of organic artifacts.